Isansys Lifecare is proud to announce it has been selected as one of the top four finalists for the Gore Technology Innovation Center Prize for its world-leading wireless patient monitoring technology. An international panel of judges selected Isansys out of nearly 500 submissions for its level of innovation, marketability, and usability. 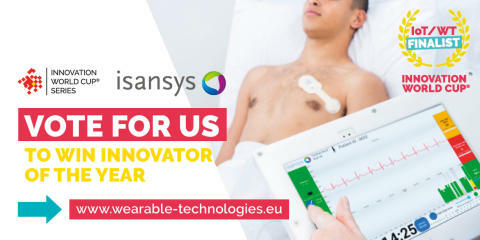 Isansys will now compete against three other companies for the Gore Innovation Center Prize on February 5th at the WT | Wearable Technologies Conference 2019 in Munich. Here finalists will present their solutions live on stage and the winners will be announced. Part of the competition has been opened up to a public vote and Isansys now needs your support to be named the winner. Isansys has created the Patient Status Engine (PSE), a technologically advanced, all wireless patient monitoring system. A complete ready-built configurable platform, the PSE is also a fully certified Class IIa CE-marked and Class II FDA medical device that monitors patients automatically, continuously and in real-time. Included in the PSE are predictive analytics including Early Warning Scores and condition-specific apps. The PSE is readily integrated with established digital health platforms (EMR’s) and presents the data and predictive scores at the bedside, at centralised remote monitoring stations and on individual clinician’s mobile devices. The PSE uses wearable sensors including the Isansys’ Lifetouch cardiac monitoring smart patch and the Lifetemp clinical thermometer providing wireless freedom for patients and near ICU quality continuous physiological data to generate robust and clinically validated real-time predictive indicators. These ensure that any deterioration in the condition of the patient is identified quickly allowing care teams to carry out more timely, less traumatic and lower cost interventions. The Patient Status Engine is the most advanced predictive monitoring system for healthcare. By measuring and analysing valuable data it transforms vital data into clinical insight and takes all the guesswork out of patient care in hospitals and healthcare facilities around the world.